Once more the North Sea Empire was at war. 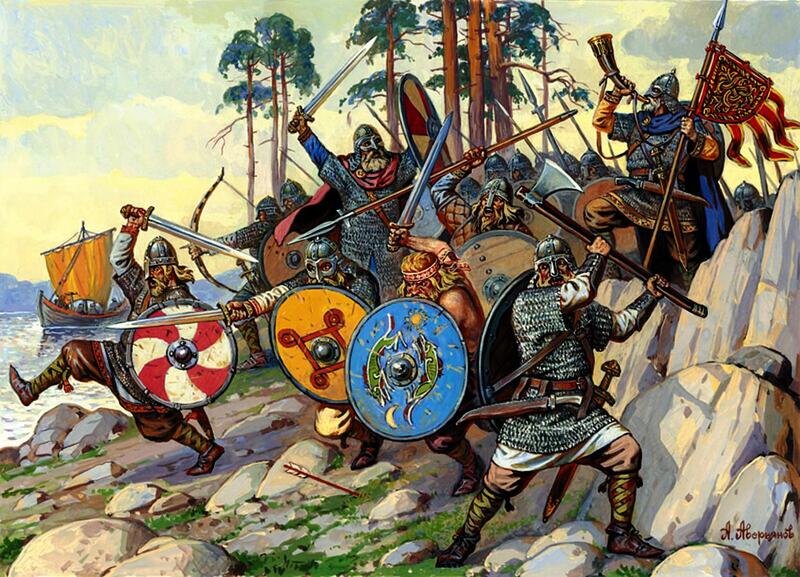 The Catholics in Germany had been a constant thorn in the side of the Sons of Odin for nearly as long as there had been a Kingdom of Norway. Once more the fury of the north would descend upon the upstart Germans and their Italian masters. Thus continues the story of High King Eirik, the Reformer. 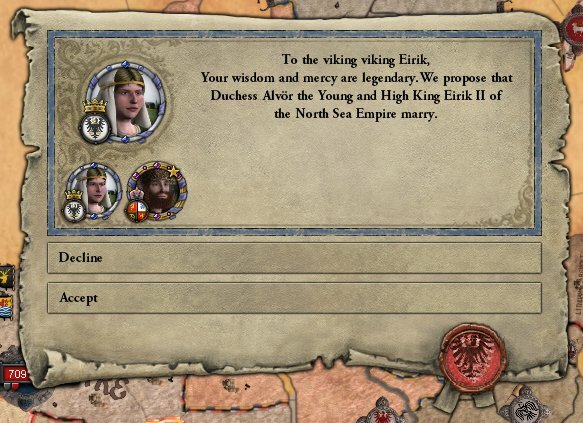 As the soldiers of the North Sea Empire marshalled for the coming war, High King Eirik celebrated his marriage. In a grand ceremony at Castle Lade, the monarch in the north was wed the Duchess of Prussia. The celebrations were soured as the words of Loki slithered through the party. This was personified by the Duke of Orkney and his conversations with several other high ranking, including the High King. Threatened with punishment should he not stop spreading such vile heresies again, the Duke quickly left the celebrations. Failure to properly deal with this outspoken vassal would come back to haunt the High King. With the celebrations completed, the High King departed Castle Lade at the head of the army. Once more a High King named Eirik marched south, although all prayed that the current monarch would have greater success than his namesake. 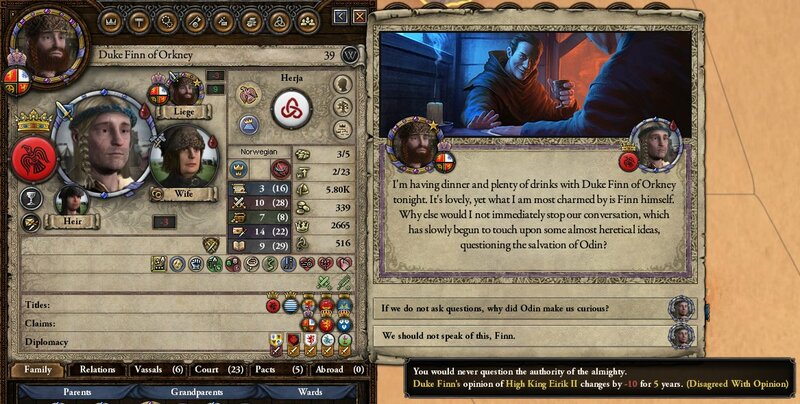 Last time an Eirik made war with a Catholic, he returned upon his shield, not with it. Whilst the men from Norway marched, the men from Frisia and Angland had already mustered and were fighting off invading Germans. Spurred on by Italian masters, the invaders had charged into Frisian lands, only to be quickly surrounded by fierce Frisians defending their home. With the main thrust blunted, the defenders became the attackers, pushing towards the goal of the war. 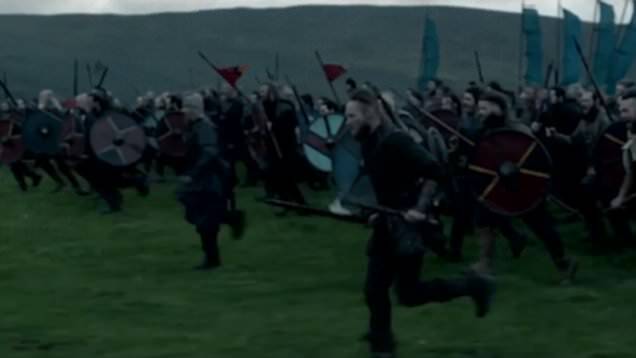 A stream of messengers would travel from the sieges in Germany to the capital in Norway, keeping the royal court aware of the progress of the war and the High King of the situation at home. 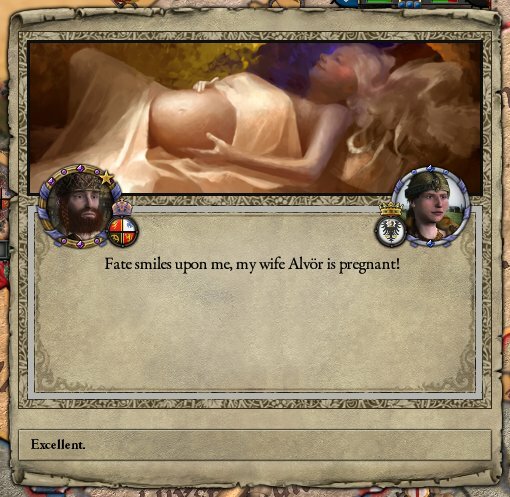 One day, amongst the reports of the status of the realm, was a report from the physician that the new Queen was with child. 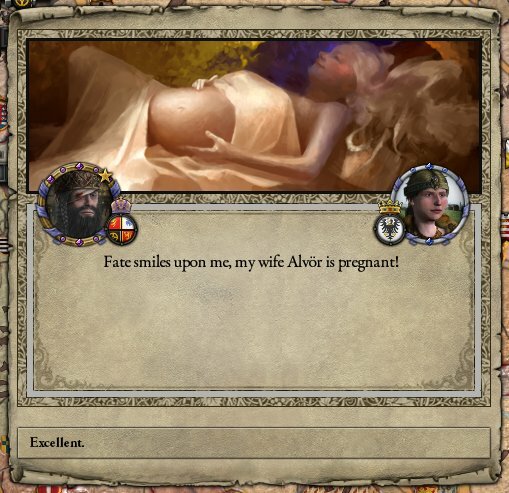 Although the timing was questionable, it was possible that the child was the High Kings, although these questions would become moot as the babe would not survive more than a few months after his birth. News reached High King Eirik that the Itailians and Germans were gathering their forces to remove his siege at Weimar. The foe had yet to muster all their forces, which were marching on the town of Mannheim, so the army of the north struck there, before they had a chance to group up. With overwhelming force, the last hope of the Weimar garrison was crushed and when news reached the defenders, they surrendered. With the losses in Germany growing and the Muslim threat growing closer to home, the lords of Italy pressured the regent to seek peace. 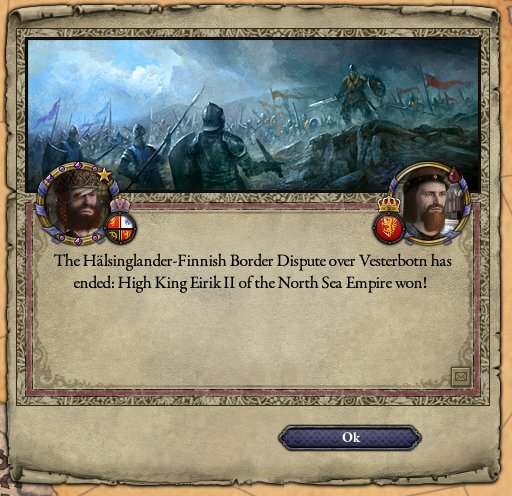 Ceding lands on their contested border, the North Sea Empire once again showed the Catholics the might of Odin. 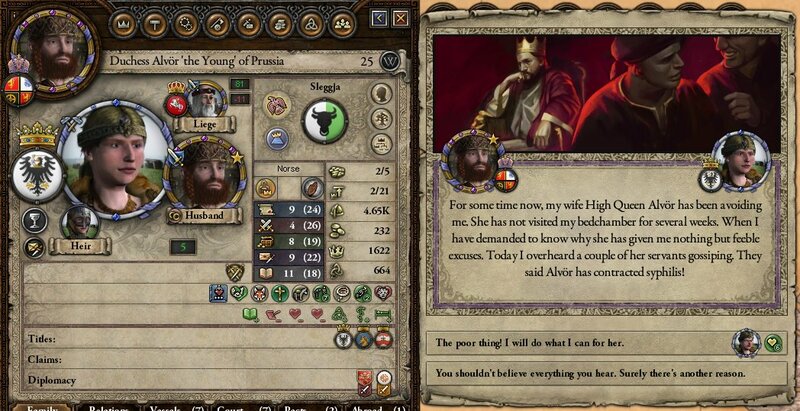 Returning home, it was time to instead give thanks Freya as High King Eiriks daughter Ingrid was married to a local Duke. 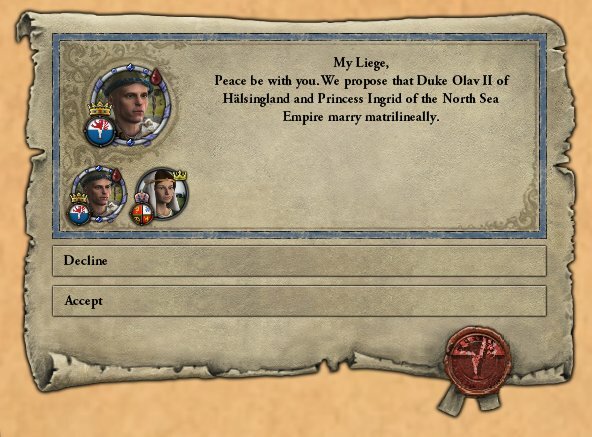 Strengthening his position at home, the support of a powerful Duke would have even more of a payoff if Ingrid was to ascend to the throne in Castle Lade. It seems however that the marriage may have been a way to secure the monarchs help against unkind rumours, or protection if these accusations had some truth to it. The High King was forced to help quash these stories to protect his daughter, but the marriage ceremony went off without a hitch and princess’ future was secured. The High King was by now an old man, and many discussing what would happens with the monarch’s death. 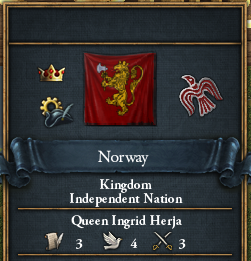 As his only living child, Ingrid was by law his successor, yet that would not mean that her reign would be unquestioned. Further, High King Eirik had shown that despite his age his seed was still strong, and his wife was young and able to bear children. It would not be unheard of for another child to be born. 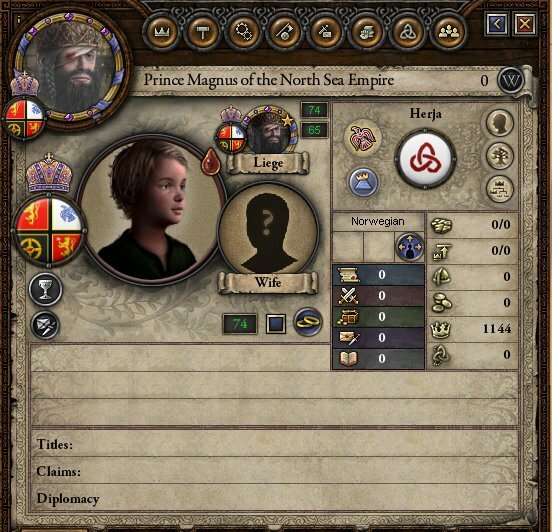 If it was a son, this babe would inherit ahead of Ingrid and it would be unlikely that he would come of age before the High King departed for the halls of Valhalla. 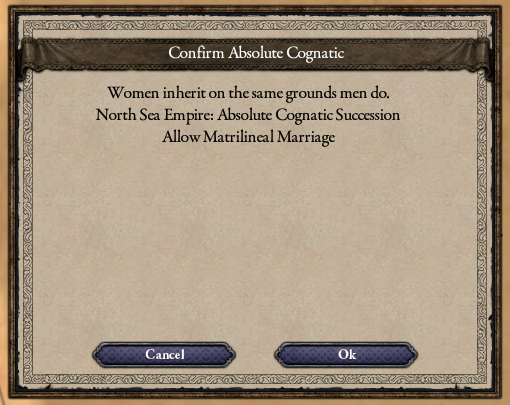 This would mean a regency would form for many years, something the lesser Kings in the North Sea Empire would surely exploit. 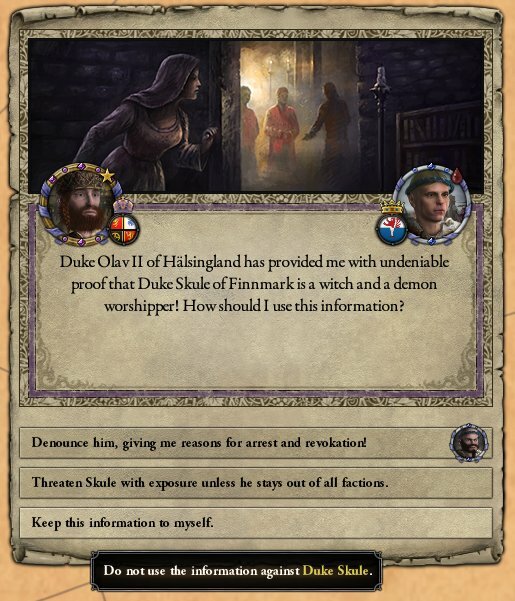 To tackle this obstacle, High King Eirik called a council of all the lords and nobles of Norway to Castle Lade, during which he named Ingrid his heir and the future High Queen. Although many were not happy at the thought of a female ruling over them, none dared raise their voice in opposition. 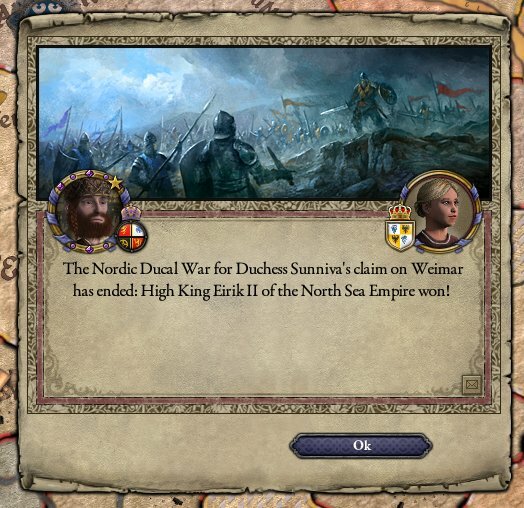 The news reached the other Kings in the North Sea Empire, and they too were furious. They claimed that they had some say in who would rule over them, yet the power of the High King was absolute and none dared raise their armies in rebellion. 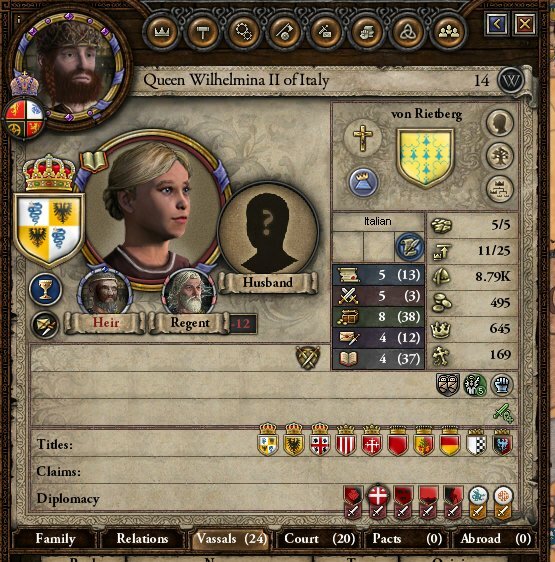 The cause of the Queen of Italy and Germany’s hasty surrender of the war was made apparent when the Christian king of Sicily-Portugal was ejected from the first half of his titles namesake. This gave the Muslims a strong position to push further into Catholic heartlands, and the holy city of Rome was now vulnerable. Not since before the acceptance by the Roman Emperor Constantine had Christians of Rome faced such a threat by another religion. The Muslims were just one of the many problems facing the major power of central Europe. Although the regency was almost at its end, several rebellions had sprung up throughout Italy and Germany. If the union would last was anyone’s guess. News reached Castle Lade that Duke Olav was seeking to expand his holding, pushing into the inhospitable north. Although frustrated at the man due to the issues he has caused near the wedding, the expansion of the northern holding would provide a more defensible position in any future large scale war with Finland. 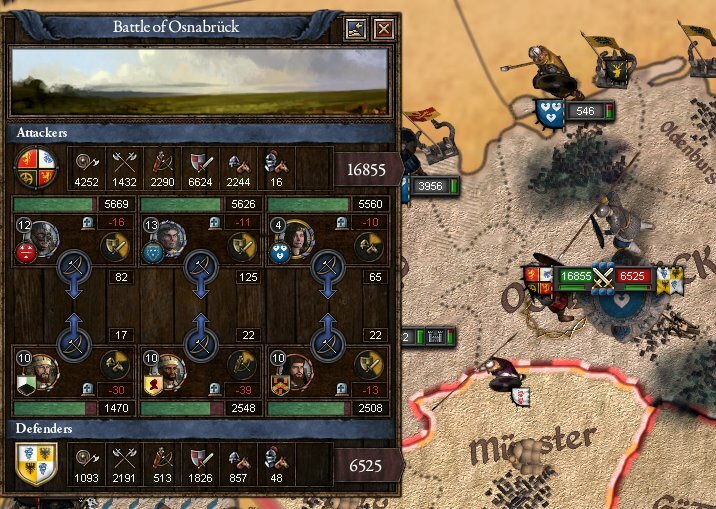 Providing men and supplies, the High King provided enough to tip the balance, but not enough that it would be obvious that the Duke was receiving assistance. The nobles had never forgiven the High King for raising a woman above them, and many plotted to bring about his death to reverse his laws and his heir. To this end the Master of Spies was instructed to tighten the defences around Castle Lade, to prevent any unexpected visitors. The betrayal however did not come from outside Castle Lade, but from within. 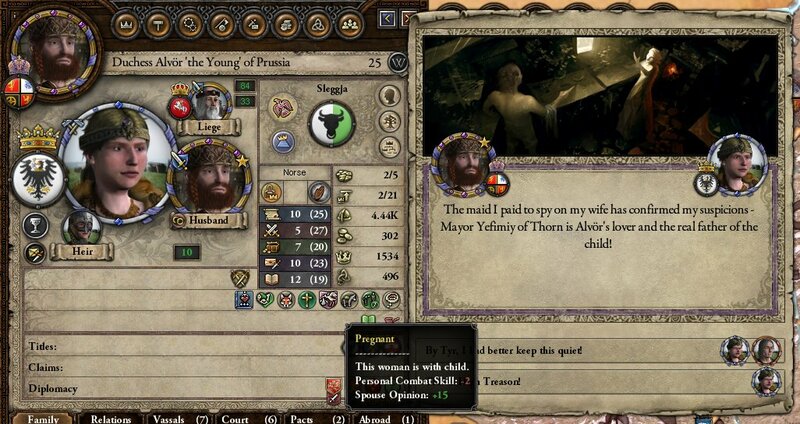 One of the maids that the High King had trusted to bring in news of a potential plot instead revealed that the Queen-Dutchess had taken another man as a lover. The deception was made public knowledge and the child be prevented from holding either Norway or Prussia. … the bastards mother would get her punishment however. 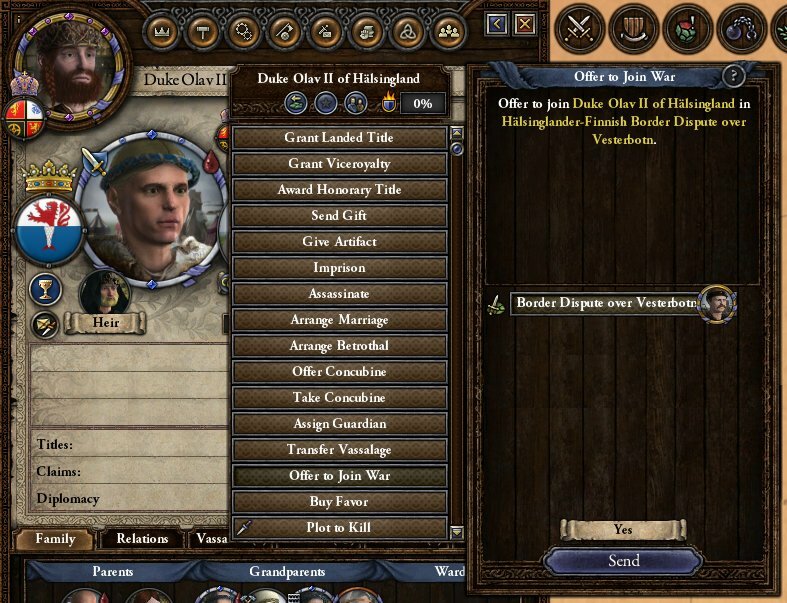 Despite the betrayal, good news would come in the form of the surrender of the Finnish king to Duke Olav. A copy of the surrender terms was also sent to Castle Lade, highlighting that the High Kings deception was not as successful as he thought. Despite the anger he held to his wife, the needs of the state came before his personal feelings. Despite being married for many years; no child had been born of their union that had survived more than a few months. Whether this one would survive until maturity would have to be seen. … To lead the Sons of Odin to their future.